In 1936 one decided to build a route with air light beacons, and in 1937 most of it was built. Salo was included in the original plans, but it was never built. The same holds fro Lohja/Lojo. One alternative for the Salo beacon was in Uskela church tower, but the parish said no. A second alternative was on a hill 3 km east of Salo, but it was not built due to WWII. A small landing field was setup. It was i simple grass field with some markers. Below you find some planning maps, and an overview map from 1936 which illustrates the planned route. These facts come from a very good report from Tauno Hermola, Salo. Report by Tauno Hermola: "There has never been an airfield in Salo before Kiikala airfield (EFIK) became part of Salo, when the municipalities were merged. However, the plan for the Stockholm-Helsinki air route included some emergency landing places close to some of the beacon-towers. 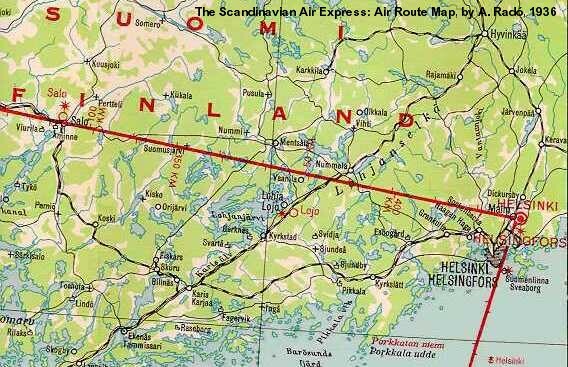 The location of the emergency landing place in Salo seems to be about the same that is shown in "Scandinavian Air Express. Air Route Map" at your webpage. Note: the decision to build the air route was made in 1936 and was mostly completed by the end of 1937; the information in the map must be based on some preliminary planning only. The emergency landing place in Salo was only a little more than a field, and was indicated in the maps as suitable place for emergency landings. Some people have recalled that there were some markings also in the terrain. The story of the lighthouse is equally unexciting. Two possible locations were selected, both to the South of the then very small town. The primary location was the tower of the church of Uskela; the alternative location was a couple of kilometers East of the church, on top of a high hill. The plan was that the church tower also would have to be raised. This plan was eventually rejected by the parish. Logically, planning should have moved for the alternative location but I'm not aware of anything such. So, there was never an aerial lighthouse in Salo." Map 1. 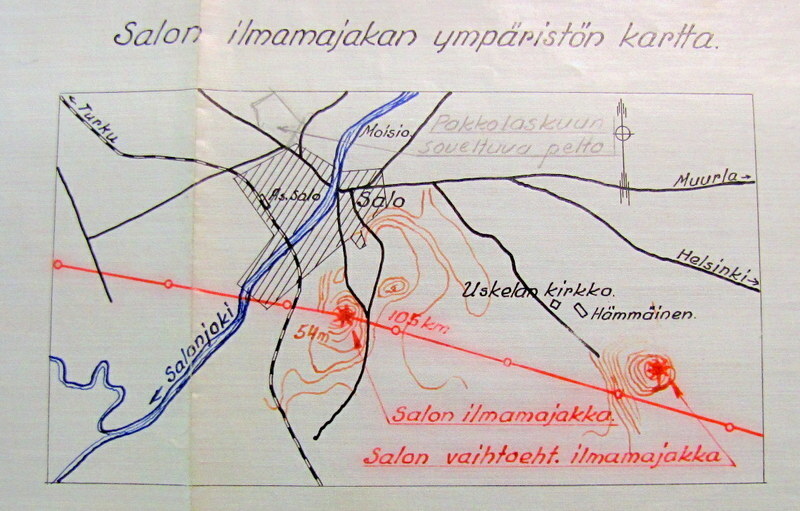 Plan for the route with air light beacons in Finland, ~1936. Map 2. 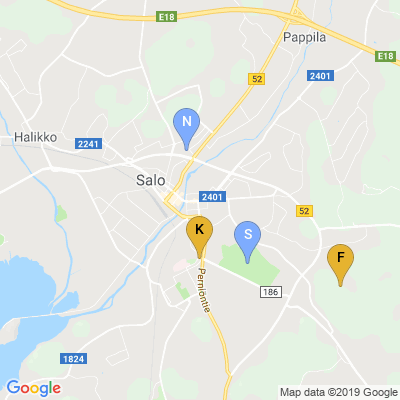 Planning map with different alternatives for a beacon in and emergency landing field in Salo. - at a field north of Salo: Pakkolaskuun soveltuva pelto = for emergency landing suitable field. - Text: at the circle betseen the two heights: varalaskupaikka = emergency landing place. Map 4. Overview map from 1936 for the planned route. 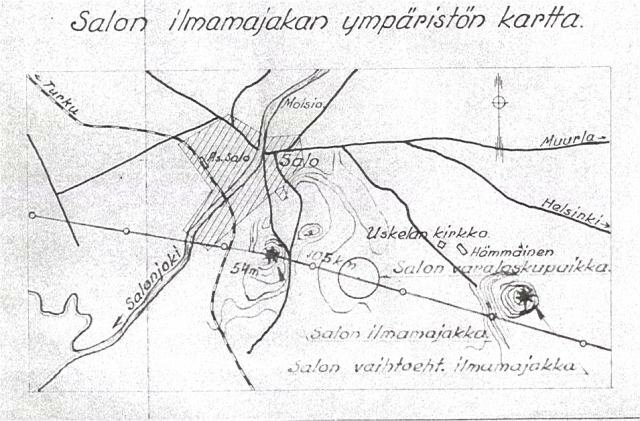 A section of a map "Lentokartta. Air Route, Scandinavian Air Express, by Generalstabens Litografiska Anstalt (1936)"
Scanning from Pauli Kruhse webbsite with Documents for the History of Finland, see link below. The full map is now available on my page: › Sweden-Finland route maps, 1930, 1936 - Sw. Note: This map was produced before the route was built, and therefore is based on the plans. Remark: In an earlier version of this page, I wrote that this map was by A.Rado, but his map is the one from 1930! K= Uskela church, F= Height for beacon. N= Emergency landing place, S= alternative.